Yeah, America? Are you busy? If not, I’d like to talk. Just a minute of your time. Seriously? You have a minute? Perfect. I was walking through Barnes and Noble today- you know, one of your chain bookstores that I want to hate because it’s killing Shops Around the Corner. Anyways, I noticed this sign and knew immediately that you and I… we needed to have a chat. Uh… America… it’s true, we have a lot of good things here. Don’t get me wrong. I mean, I don’t want to live anywhere without you. You are clean, convenient, and speak English. But we also have quite a few serious issues. Gas prices currently being one of them. 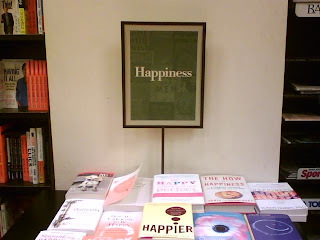 Another bigger problem is that you try to make us think we can find “happiness” on this table. So America, do me a favor. Please stop making us think that happiness is a state to be attained. It’s not. It’s an emotion. Passing. Not lasting. There aren’t enough books to be bought to make us permanently happy, even though you have conveniently placed them all on this one table. Which I do appreciate. Give me a table that says “Joy”. Put a Bible on it. And maybe a Beth Moore workbook. And a Third Day CD. But those last two are optional. Then I will quit bothering you. Heather’s delicious Sopapilla Cheesecake (go to this post and read comment #4). Make that, eat it, and you will feel happy. Go sit on your front porch, put your computer on Nashville Annie’s MySpace, and just listen. That will make you feel happy. But trust me. The cheesecake will soon disappear, the music will end. And if you want something to last, start with Isaiah 58. It’s good. Hey, America. Thanks for your time. I always enjoy our little chats. And by the way, I’m praying for you.